Wedding are one of our life most memorable events. Here at Platinum Elite we handle your special day as if it was our special day too! 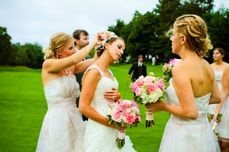 Our goal is to make sure our Bride is stress free to contend to the extra details of her attire and allow more time with her bridesmaids. We pride ourselves on being a one stop shop for your wedding day. Our goal is to please you and make sure that you are as comfortable with us as we are with you far beyond the start of your planning. We offer free consultations in person as well as virtual interviews via SKYPE by request only. We want to make sure our first connection turns into many more fun times and connections with you, your friends and family. platinum Elite takes very special care ins electing our vendors and therefore we work with the best and with those for whom we have developed years of experience with. In addition to providing you with a professional photographer, our in house staff will be there to capture those quirky moments that are once in a lifetime expressions included in your wedding package. Full Wedding planning Services includes most things imaginable in order to have the event of your dreams. The list below is not inclusive but will give you an idea of the individual packages available. Partial Planning consist of less than haldf of what teh Full Wedding planning Services are. There are good and bad things with partisl planning. First, in order to hire a planner for partial services, it means you have done more than 50% of the work your self already. It also mean sthat you may not have received the discounts that a planner with a great work reputation migh have received. With partial planning you take the risk of hoping that what was already done pre-planning hire comes together with post-planner hired. You are responsible for coordinating with the chosen vendors and providing proper staff for servicing your guest.